I dearly loved this sweet man. I knew him through Fairvue as the starter. He always had a smile on his face and always talked to my young grandsons and would tell them he loved watching them warm up on the driving range and that they were hitting the ball great and he was sure they were amazing little golfers!! They loved Mr. Harold!!! I never knew he was also an Adventist like us! We go to Hendersonville SDA! I am glad we have the promise that we will be reunited when our Lord Jesus returns! Prayers for his family and friends! We will miss him dearly. He always had a smile on his face and made those of us who played the game of golf so amazed to watch how he interacted with both young and old. My wife Julie and I are very sorry for your loss, but we know he lived his life to the fullest. May we all be so lucky. We are so sadden to hear of Harold passing. He was such a sweet man, always greeting us with a smile. We remember how excited he was after his special Flight of Honor visit to Washington DC. 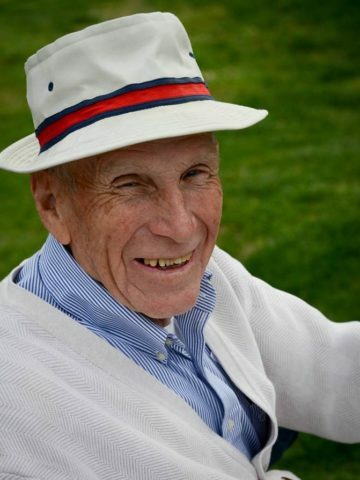 We will miss him and his positive attitude each time we take our stance on the first tee box at Fairvue. Rest In Peace dear friend. Harold will be missed. He was a true gentleman and always extended a kind word and a friendly smile to every golfer who passed his way. What sad news for Cindy and me to hear about Harold’s passing…. Harold was a true gentleman in every sense of the word! As my starter at Fairvue during my 5 1/2 years at the Club, Harold helped provide such a positive and heartfelt word any time a member encountered him. He truly loved people and anyone who encountered Harold reciprocated that love back to him. Harold was a huge reason my time at Fairvue was such a pleasure!! When I deal with people, I will always strive to keep Harold’s wonderful attitude about life in my thoughts and deeds… Cindy and I wish our very best to his family, and even though Harold has left this world, please take solice in the fact that he made a huge impact on many people’s lives, especially to mine! I had Mr Young as my teacher in the.5th grade and the 8th grade, he was such a nice man, always had a smile on his face, he was a good person and a.good teacher. RIP Mr. Young, you will be missed! I am so sorry. He was a wonderful man, a great teacher, had a lot of patience. So sorry to hear this! Mr. Young was such a sweet man! Our hearts and prayers go out to Richard and Martin and the entire family. We will definitely be with him again someday soon in Heaven! So sorry to hear about the passing of our beloved starter Harold. Always had a smile on his face and one of the sweetest, kindest men I have known. Rest In Peace Harold and know that you will truly be missed. Wow what a wonderful man we lost. Harold and I hit it off early on. How could you not love a man that smiled right through you. He was so surprised that I knew where Catawba College was. I told him I had played on their football field. Eternal Blessings my friend.